Too often blurred with the bright colours of the Elizabethan era that preceded it, the Jacobean Age displayed a different, and no less striking, musical mien. Religious consolidation, the slow-dawning secularism of thought and society, and a pervasive strain of melancholy left its mark on music that is serious, complex and rich, delighting in subtle variety of mood and intricacy of workmanship. 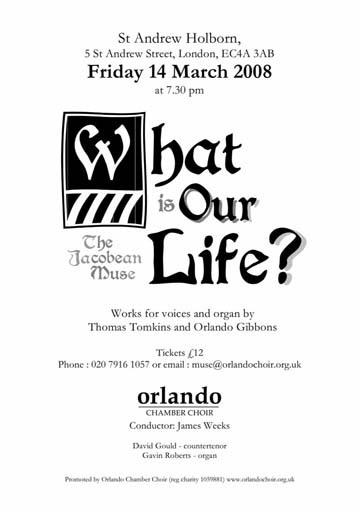 Our concert celebrates the two greatest musical lights of this fascinating time, Thomas Tomkins and Orlando Gibbons, through their madrigals, keyboard works and church music.